In olden times, it was recited at every Great Moon or Cherokee New Year festival so it could be learned by young people and the tribal lore perpetuated. It was set down in English in an Indian Territory newspaper by Cornsilk (the pen-name of William Eubanks) from the Cherokee language recitation of George Sahkiyah (Soggy) Sanders, a fellow Keetoowah Society priest, in 1896. 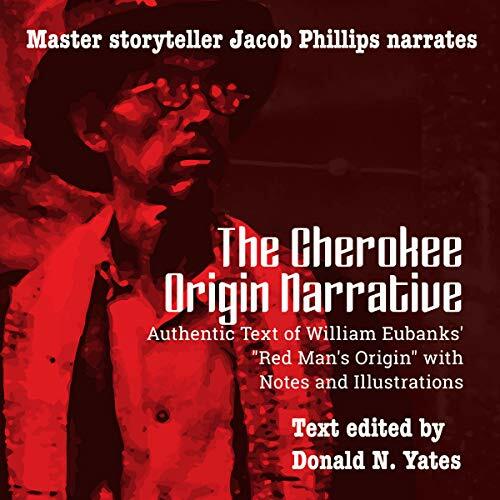 We do not have anything anterior or more authoritative than Eubanks and Sanders’ Red Man’s Origin, presented here as The Cherokee Origin Narrative. Mystic and plain-spoken at the same time, it tells how the clans became seven in number, reorganized their religion in America, and struggled to maintain their “half-sphere temple of light”. You will hear in Cornsilk’s original words about the true name of the Cherokee people, the deathless Uktena serpent, divining crystals of the Urim and Thummin, “terrible Sa-ho-ni clan”, and other Cherokee storytelling subjects. The brief narrative is edited with an introduction and notes by Donald N. Yates, author of Old World Roots of the Cherokee and other titles in Cherokee history. If you own one audiobook about the Cherokee Indians, it should be this one. Second edition (August 15, 2017), with new title and revised. Replaces Red Man's Origin (2013). Why Can't I Understand My King James Bible?